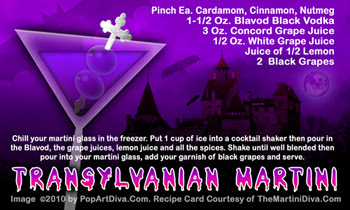 The Transyvlanian Martini is definitely not sour grapes for Halloween, in fact it's sweet from the Concord grape and white grape mixers. To keep it from being too sweet there's a little bit of lemon juice and a healthy dash of cardamom, cinnamon and nutmeg. Think spiced mulled grapes in place of the traditional spiced apple cider. This is a perfect cocktail to turn into a non-alcoholic mocktail for the kids and non-alcoholic guests at your party, you simply remove the Blavod vodka from the recipe! Add a little black food coloring to the virgin version if you want the same deep, inky black night effect. Your Trick or Treaters will go bats over this one!